Was on time in the Hotel , Driver was experienced , The Tour Guide had good knowledge, explained very minute details regarding the Places, friendly with Kids, overall we had a good experience in our 6 Hour trip. Thank you so much for the review and kind words! It will be pleasure to host you in Armenia also in future! The tour I much enjoyed! 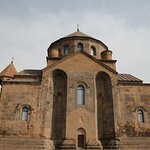 We visited the following places: Hripsimeh & Gayaneh churches, Zvartnots temple. The memories from that Sunday tour are precious for me. The liturgy... liked it much. Thank you Hyur Service for my unforgettable tour. We are very grateful for the nice review! You are always welcome to Armenia! Thank you for the warm words! Thank you for choosing our company! Hope to have another chance to host you! We are very grateful for nice review! It will be pleasure for us to host you in Armenia again! Our tour to Holy Echmiatsin was perfect ! We just want to thank you for the wonderful time we had during this tour. Special thanks to your professional driver and tour guide Maryam. She was super-knowledgeable and super prepared ! 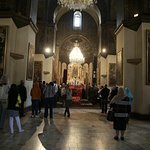 Get quick answers from Group Tour: Echmiadzin (Mother Cathedral and churches, liturgy), Zvartnot Temple staff and past visitors.